AccountSight online time tracking software is constantly providing a better user experience for businesses to manage their projects. With every new upgrade, AccountSight has added valuable features to ensure an easier and smoother workflow transition from time tracking to invoicing for clients. The latest release AccountSight v2.21 is no exception. Keeping in mind the users’ needs to utilize timesheet data in QuickBooks software package for accounting purpose, AccountSight time and expense tracking software has introduced the functionality of QuickBooks integration that will help users to easily and quickly export data from AccountSight to QuickBooks accounting software. Every organization must efficiently take care of their accounting activities. Be it a big enterprise, a small startup or an independent freelancer, contractor or consultant, any business has to do necessary accounting procedures to document their finances as well as comply with government regulations. Therefore, it is very important to have a system in place that will enable users to extract all timesheet data from the time tracking and invoicing software and then import that data to QuickBooks to take care of cash flow, P&L and other activities. To integrate AccountSight with QuickBooks and use the data export feature, you first need to install the ASync application. If your organization is using AccountSight, the admin can login to his or her account and download the ASync installer from there. ASync will work as the interface between AccountSight and QuickBooks. Once ASync is installed, you can instantly start importing data to QuickBooks. First, you have to extract and save your chosen data from your AccountSight account in your local machine in the required CSV file format. The ASync user interface provides a number of operations. It allows users to separately import timesheet data. Prior to data import, the selected data is first validated in order to check if there is any error in the data formats. Upon successful validation, data can be imported to QuickBooks instantly. You can extract all or filtered timesheet data (specific to customer, project, task, person or other criteria) and directly feed it to QuickBooks to perform various accounting operations. You only have to install the ASync application to establish the connection between AccountSight and QuickBooks. You can download the ASync installer from your AccountSight account and install it in a minute. No other external software, add-on or application is required. The integration process is extremely fast and user friendly. 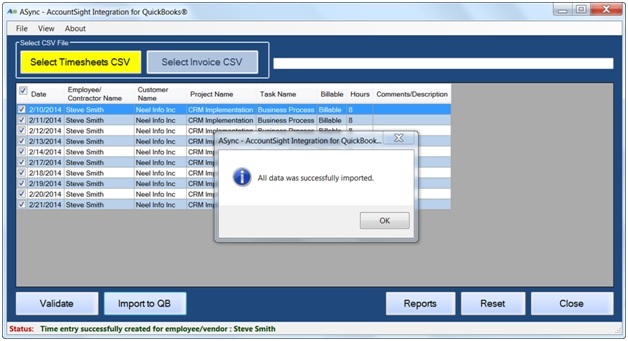 You can import data from AccountSight and export to QuickBooks in a couple of minute’s time. It’s easy to understand and simple to operate. Are you struggling to integrate your QuickBooks application with your current inefficient time management software? Then it’s time add AccountSight to your software suite. Use it and see the difference. Start with the 30 days free trial! Register and start using it instantly! Also, check out other amazing features offered by AccountSight to efficiently track time and project expenses and to invoice clients online.